Of many current actors, Leonardo DiCaprio has made the best career choices. Even credible film stars like Robert De Niro and Al Pacino have their stinkers, making you wonder what they were thinking as they signed on the dotted line, but taking a quick look at the career of DiCaprio and you can’t help but think he has made choices that have, for the most part (Man in the Iron Mask) paid off well. 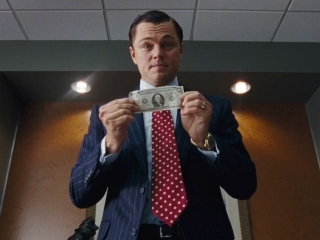 The Wolf of Wall Street is no exception and will ultimately be a role he is well-remembered for. It is unusual because the person he plays is actually extremely obnoxious and terrible. He takes drugs, cheats on his beautiful wife and exploits people in such a way that makes him super-rich with little to no remorse. You shouldn’t like him, you should be constantly rooting against him but ultimately, you are on his side and drawn into his story from the very beginning. It helps that Wolf of Wall Street manages to be intoxicating from the outset. 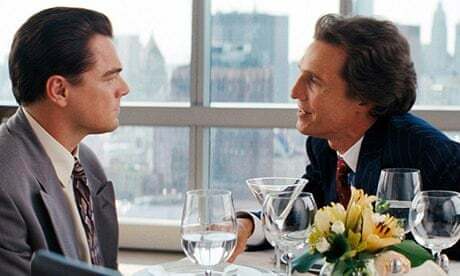 It is a story about greed and playing the system to excess and nobody seems to portray this better than Matthew Mcconaughey. 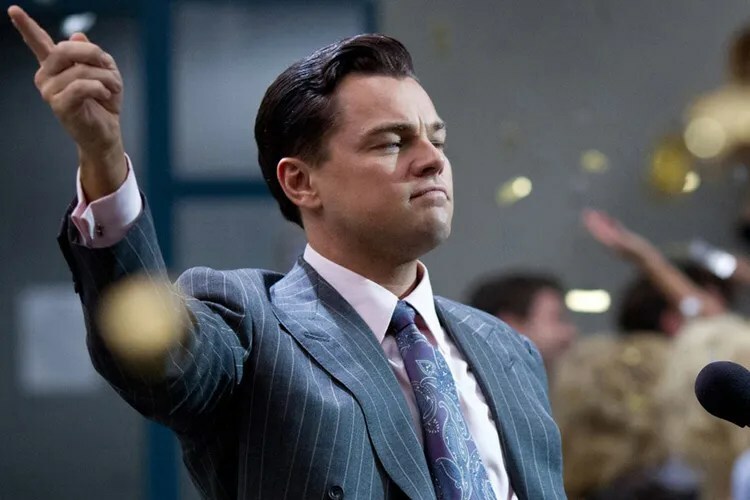 He makes a fleeting but impactful appearance that inspires DiCaprio but also draws in the audience, foreshadowing the mayhem and craziness that will begin to envelope each character. It is crazy! Martin Scorsese delivers a movie that seems so incredible and unbelievable that you’d never imagine it was actually a true story. Big yacht parties, dwarf tossing and more drug abuse than anyone could be expecting to withstand – all leads to create a movie that is aware of its excesses and dials that up to 11. Nobody manages to portray this better than DiCaprio. The actor is never off. He leads inspiring speeches, desperate pleas and some of the funniest drug trips you’ll ever see. All dialogue heavy, dramatic moments in the movie are completely surpassed by DiCaprio trying to get into a car after taking paralysis inducing drugs. It’s a great example of committing to a role and the scenes that follow it, including the aftermath of the fact and a stark, harsh realisation of his actions, deliver some of the best moments in the movie. DiCaprio is supported by actors at the top of their game. Jonah Hill is his partner in crime and plays the average everyman who gets sucked into some awful, excessive moments of his own. Margot Robbie completely puts her Australian soap career behind her with a star turn as DiCaprio’s trophy wife and a victim to his actions. This is DiCaprio’s movie though and a great chance for him to demonstrate his acting talents. Scorsese does stretch him and its no shock that his best work is with the iconic director. Scorsese throws everything at this move and it’s star – almost labouring the point a touch. There are only so many excesses and crazy moments that any one person could have lived through, let alone have an audience watch. At times it feels like we are getting a repeat of the story we have already seen and with a running time of 180 minutes, it feels like aspects of the story could have been trimmed. It is a small complaint however and it does build a great picture and a very interesting story. Dwarf tossing?!?!! I obviously haven’t seen the movie but I agree with you on Leo’s choices. He continuously chooses quality stuff. Either he has the best instinct on movies or he employs a great team. He is so likeable though, a rare quality that only the biggest movie stars have…. a great review! Makes me want to see the film…. It is worth your time if you ever get chance to see it. Thanks for stopping by. Previous Previous post: Bring back proper opening titles for TV shows!